Tony Hoffman’s ability to connect with our high school and middle school students was breathtaking. I have been in education for 20 years and have never seen two large groups of students glued to a presenter the way our students were glued to him and his story. Tony makes a genuine, heart wrenching effort to save students from taking the same path that he had chosen. He tells his story in a very real and relatable way that even the adults in the room hung on to his every word. His message was one that resonated with all of our students regardless of their age, race, social and economic status. He did not talk at the students. There was a clear and high level of engagement between student and presentor. The presentation was meaningful and touched on many serious topics that we see in our schools today. The stars aligned on this Pennsylvania substance abuse speaking tour I just finished up. A staff member apart of Cambria Schools contacted me after I had set up the event for Glenn O. Hawbaker and it turned out these 3 campuses were just a short drive from each other. So naturally we worked hard to link them together and in a pretty fast and orderly fashion. I appreciate everyone’s level of intent when it came to putting this together. Sometimes schools can be extremely fussy about pulling kids out of the class to put them in front of speakers or other presentations. That was not the case for Cambria High School and Middle School. I was set to give my speech that I really try to convey is not a “Drug Talk”, it’s so much more than that and because it’s from the heart that is why kids are connecting with me during the speech and long after in my social media inbox. Both presentations were incredible in my opinion. The students were so awesome, I really appreciated their level of respect and engagement in my Q & A session afterwards. I stuck around for as long as I could before I had to leave to get to my flight before I missed it. One cool thing that stuck out were all the students who cheered for me as I was walking out of the school. That felt really really cool! Cambria School District, thanks so much for working hard to make this happen on short notice, you guys rock! “Tony’s program was riveting. He was able to take us on an emotional rollercoaster, all the while driving home the point that each one of us has our own unique story that has molded and shaped us into the person that we are today. — Josh Hull- Business Development Coordinator- Glenn O. Hawbaker Inc.
“Our school was honored to host Tony Hoffman on our campus to share his story with our students, staff, parents, and community members. In recognition of a drug issue at our school and in our community, student leaders came to me to request a speaker who might inspire our student body. After a great deal of research of guest speakers, our students chose Tony because of the message that he delivers as well as his ability to relate to students. Tony delivered far above and beyond our expectations. He completely captivated the attention of our 1,400 students and staff for an hour and a half, which is absolutely unprecedented. During the question and answer part of his talk, we were able to clearly hear questions that came from the top row of our balcony, as students were that attentive to what he had to say. Afterward, Tony spent the remainder of the day in our building talking with students and visiting classrooms. Moreover, he has continued to respond to our students via social media. His impact is lasting long past his time with us. Tony's "The Choice" was provided to our secondary students in light of our community and students being impacted by the national mental health and addiction crisis. Tony's story in itself was powerful; but what had the greatest impact was his raw and poignant authenticity that cut through economic or social status. His story truly reached the students. After each presentation, Tony made himself available for individual conversations and genuine human kindness. It is clear that this is his calling and that his story and wisdom will prevent so many others from making a choice that will adversely alter the course of their lives forever. I have not seen anyone better do this kind of transformational work that is desperately needed in all communities. Avenal to me is considered a local community since it's only an hour and 20 minutes away. But my biggest attachment to the city of Avenal is that I paroled from Avenal state prison on December 13th 2008. Avenal is largely a farm community but a lot of people also work at the prison. 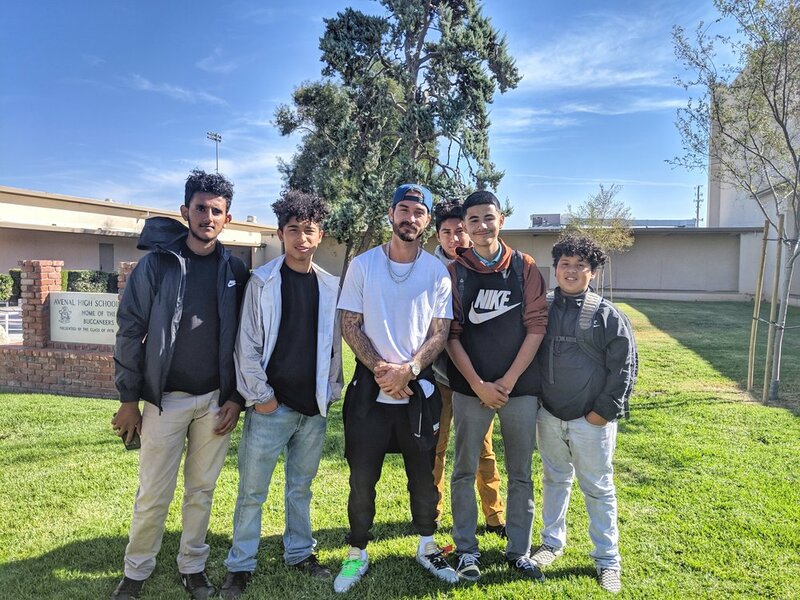 And the reason I came out to Avenal High School to speak is actually a very cool and heartwarming story. Many years ago when I was in the beginning of my speaking career, about 2011, I gave a presentation in a city called Hanford. It was to a small youth conference being held there and one of the staff that attended heard me speak and she told herself that if she ever got an opportunity to bring me to her communities that she would make it happen. Well 7 years later, she made it happen and what a beautiful soul she. My first speech was to be given to all of the high school students, who are largely a Hispanic community. As usual the students were extremely respectful and very attentive during my speech, we spent a lot of time afterwards taking pictures and talking which is always an indication of how relatable I was to the kids. My second speech was to a group of community leaders where my main focus was talking about my non-profit organization the Freewheel project and why I believe we were unique and making many strides towards changing lives. I talked about my theories of empowerment versus educating in the dangers of harmful substances we want to keep youth away from. I believe that we should be empowering students through gifts and activities and teaching them life skills and those moments where the kids are enjoying themselves and threw them they would make the right choices and stay away from those harmful substances we want them to avoid. I believe this was well-received and I was grateful for an opportunity to be able to give them a speech in which I don't get to give often but wish I did.